Fenzi North America has designed and built a 'State of the Art' manufacturing facility, offering a true 'Polysulphide' to the North American Insulated Glass market. Located in Toronto, Ontario and servicing North American manufacturers of insulated glass, Fenzi North America is a subsidiary of Fenzi S.p.a, the Italian polysulphide, mirror backing paint and ceramic frit manufacturer in Europe. The Fenzi Group are world leaders in these markets and others serving the fenestration and glass fabrication industries. Alessandro Fenzi said "the time was right to show our commitment to the North American IG and window markets by investing in a state of the art manufacturing facility that can service North American needs with North American raw materials". Fenzi polysulphide manufactured in Toronto is produced to the same high standard as that produced in Europe. For the last 30 years Fenzi has produced Polysulfide (Thiover ®) that is non-hazardous and contains no solvents - yet has the ratio flexibility and reliability of traditional polysulphide. This is not an old product but rather a product produced in the most environmentally sensitive way for the future of the insulated glass manufacturing process. 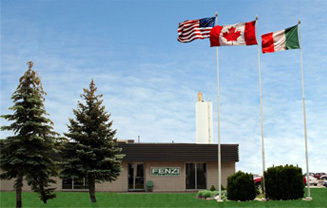 The Toronto Fenzi North America facility is also a major distribution centre for Fenzi S.p.a made Butylver Polyisobutylene, (PIB) - as well as aluminum and warm edge spacer bar products servicing all of North America. If you are looking for a partner that can always provide the best solutions, Fenzi is your best choice; in fact, it is the only multinational chemical company that is totally dedicated to flat glass processing. This choice is shared by countless trade people across the five continents; a growing popularity that has made Fenzi the global leader it is today. a warm and personal business approach. Working with Fenzi brings countless benefits. You will discover that Fenzi always offers the perfect balance between innovation, quality, competitiveness and efficiency. Fenzi products are valued around the world because they at the forefront in their respective sectors. But behind these products is a working method you will like: the Fenzi style.